After your bike itself, it’s likely that buying a motorcycle crash helmet will be the most expensive biking buy you can make and, in terms of safety, it’s probably the most important. But with prices ranging from under £30 to well over £1000, types varying from open face to full face to ‘flip-front’ to off-road style and more and with a huge variety of brands, styles and materials, what do you go for – and how do you avoid ending up with something that could endanger your life? Our guide is intended to help you make the best, informed choice. The first things to understand is that if you’re riding a powered two-wheeler on the road, whether that be a 50cc scooter or moped or a 1000cc superbike, an approved safety helmet is a legal requirement. Under European law, which the UK is still subject to, all helmets used on the road must adhere to European standard ECE22.05 where ECE stands for ‘Economic Community of Europe’, ‘22’ stands for the number of regulations for testing, and ‘05’ stands for the amendments made to the regulation in 2005. Helmets that meet this standard have a marking stating this, usually found on the strap. Many helmets in the UK also carry an ‘ACU Gold’ sticker which qualifies the helmet for use on the track so this is necessary for track days and racing but this has absolutely nothing to do with road use. Helmet designs fall in to three basic types: Full face, Open face and flip-front. Full face helmets are the almost spherical ones that cover the entire head and face and has an aperture to see out of which is usually covered by a moveable visor that protects the rider’s eyes when closed (although occasionally goggles are used instead, particularly with off-road designs). Full face helmets. Because of their all-enclosing, rigid design offer the most protection and are the most popular style among motorcyclists. Open face helmets, at the name suggests, are similar to full face but leave the face and chin exposed – and so don’t offer as much protection. Open face helmets also predate full-face helmets, first becoming popular in the 1950s and ‘60s (FF helmets weren’t developed until the early 1970s) so have a more ‘retro’ look particularly popular with cruiser or classic bike riders. They also allow better visibility and, being more basic, they are also usually cheaper than FF helmets, too, although a visor, goggle or at least sunglasses are recommended as well to give at least some eye protection. Flip-front helmets are the most modern type, having become popular in the 1990s. 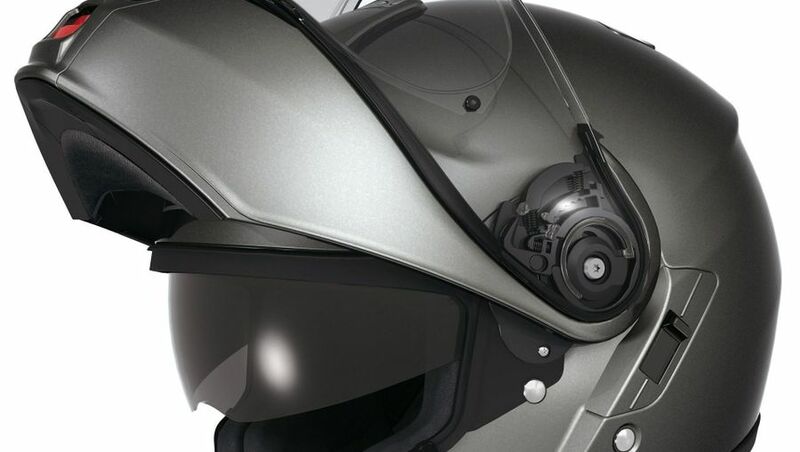 Essentially they combine the best features of both designs whereby a hinged front section means that, when in the down position the helmet appears to be a full-face, and gives much of the protection and security of that type. While, with the front raised up, the wearer gets the same benefits as an open face. Due to their sophistication, flip-fronts are often the most expensive of these types although they inherently are not quite as protective as the full-face design. Generally helmets of all styles have a hard outer shell, usually made of fiberglass, carbon fibre or composite, plus an inner layer of usually multiple layer, shock-absorbing material, usually expanded polystyrene. Inside that is a ‘comfort’ lining normally comprised of soft foam and cloth. What type should I go for? Only you can decide your budget or know your requirements. But generally speaking, the more you spend, the better helmet you get. We would also always recommend going for the most protective type – ie a full-face – but also understand the appeal of an open face (particularly for slower speed, scooter riders, for example) and flip-front designs. We’d also recommend trying as many different types as possible before making up your mind. Whichever you go for, though, it’s crucial that it meets the EC standard, is new and from a reputable brand and fits correctly. Don’t they also have a strap? Yes – and it’s vital that it’s used and adjusted properly to ensure the helmet doesn’t come off in an accident. Two types are commonly used: a ratchet or sometimes called ‘seatbelt’ type, which clips together and is the quickest to release. Or the more traditional ‘Double D-ring’ system, whereby the strap is fed into a locking position through two metal rings. This system is often considered more secure as it can’t be accidentally released. It’s absolutely vital that your helmet fits correctly. After all, if it’s too small, you won’t be comfortable and will be, at best, dangerously distracted from your riding. If it’s too big it won’t protect your properly in an accident or, at worst, come off completely. The starting point for getting the right fit is choosing a helmet that’s the right size. Generally, we’d recommend you have this done in-store by a professional to ensure no mistakes are met, But in simple terms helmets sizes are in cms and is the circumference around the crown of your head (ie above your ears and eyebrows). XS is 53-54cms ranging up in 2cm increments to XXL which is 63-64cms. Do all helmets fit the same? No, due their varying shapes and constructions – which is why it’s vital you thoroughly try a variety of helmets before buying. Ideally you want something that feels snug and solid, has no uneven pressure points, is comfortable and yet doesn’t move around on your head. You should also err slightly on the small side – new helmets ‘bed in’ and loosen slightly over time but make sure it’s not uncomfortable by wearing it for quite a few minutes in the shop when trying it on. Yes, other features are always worth considering, such as weight, types of ventilation, whether the lining is adjustable or removable for washing (many are), how easy the visor is to change, etc etc – plus of course how much you like the design or colourscheme. However, all of this is subjective and there’s no hard and fast answer to which is best – it all depends on your circumstances, taste, budget and requirements. Happy hunting!